All aluminum Glazing Bar & Cap. The Glazing Bar is used to splice the panels every 6’ on center. The bar is fastened to the frame at each cross member. The Glazing Cap fastens to the glazing bar to hold the panels in place. Fasten cap to bar with #10 x ½” ST screws 12” on center through the pre-drilled pilot holes in the cap. Available in 8’, 10’, 12’, 20’, & 24’ Lengths. 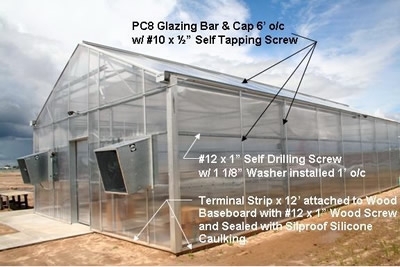 Aluminum Terminal Strip seals the lower end of the panels and keeps contaminants from being drawn up into the panel cells. Condensation is kept away from the inside of the panels. Weep holes allow condensation to drain to the outside. Use the Terminal Strip for the roof panels at the gutter, wall panels at the baseboard, at the vent bottom rail, etc.